1891. Cyclone hydraulic baling presses. 1904. 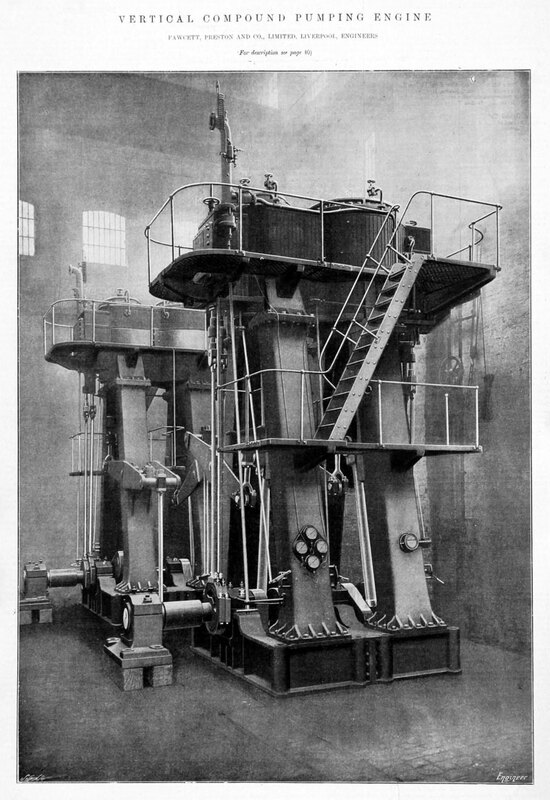 Vertical compound pumping engine. Portable Riot Shield. Exhibit at the Museum of Liverpool. Portable Riot Shield (detail). Exhibit at the Museum of Liverpool. 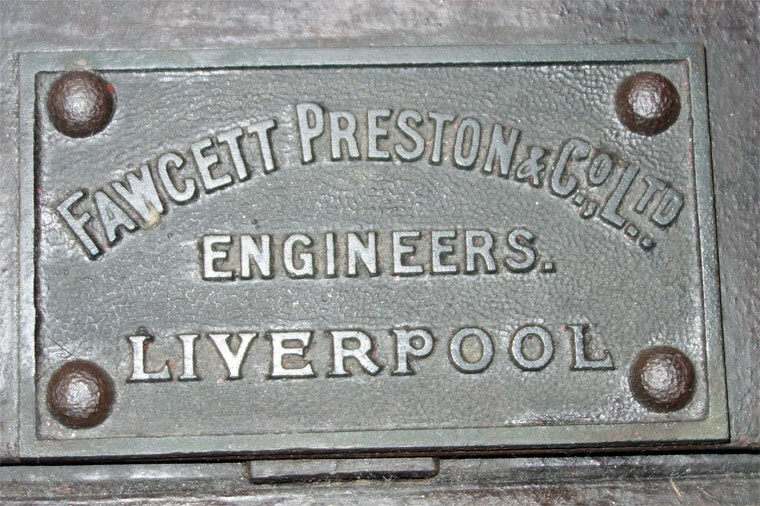 Fawcett, Preston and Co of Phoenix Foundry, York Street, Liverpool. Subsequently at Bromborough, Cheshire. 1758 Foundry established by George Perry as the Liverpool branch of the Coalbrookdale Co, specialising in three-legged cast iron cooking pots. 'THE LATE FIRE IN YORK-STREET. In consequence of the FIRE which occurred at Messrs. Fawcett, Preston, and Co.'s Establishment, in York-street. upon the 7th day of March, the MILLWRIGHTS, MODEL MAKERS, and JOINERs have lost their TOOLS, which, from the extent of the Premises, and the rapid progress of the Fire, it was found impossible to save, by which they have sustained a loss, amounting to £393; and most of them having Families, they feel themselves necessitated to appeal to the liberality of the Public to mitigate their heavy loss, and beg to state, that several Gentlemen have formed themselves into a Committee, to apportion the amount received in proportion to the loss sustained by each individual. They have to add, that Books have been left at the various Newspaper Offices. ....' There follows a list of 36 contributing firms and their donations. 1848 Built one railway locomotive and this was bought by the East Lancashire Railway. 1854 Announce they have acquired a large plot of ground fronting the Birkenhead Great Float to where they will move their boiler works. 1863 The firm consisted of Herman James Sillem, William Thompson Mann, Jacob Willink, Henry Berthon Preston and David William Thomas. 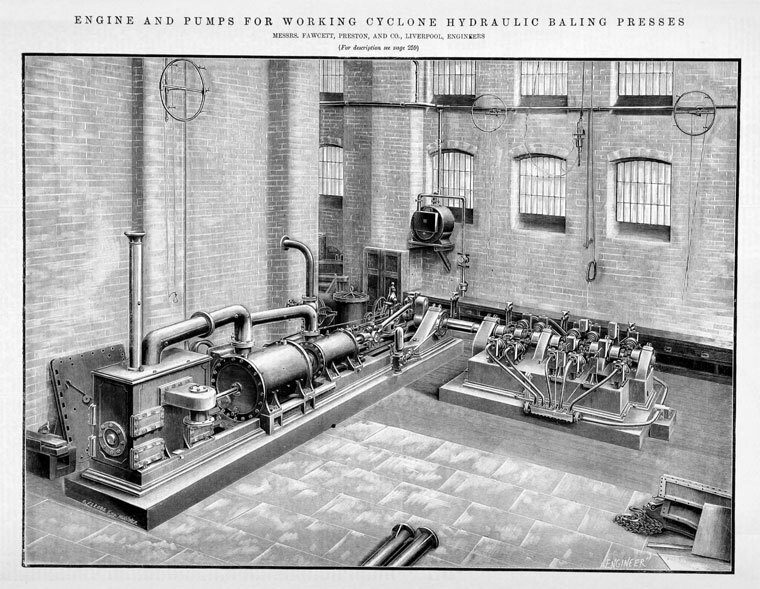 1891 Description of their works in 1891 The Practical Engineer. Also manufactured the Cyclone press of Mr. James Watson, used for pressing jute, cotton, silk, feathers, etc. 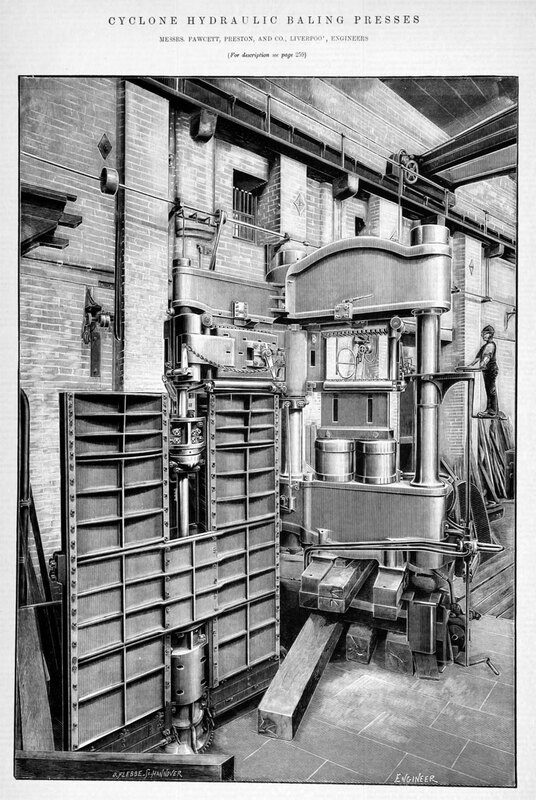 1894 Two Woolf Compound Beam Engines for Wallasey Waterworks (Liscard Station). 1901 Mention of Alfred Chapman as managing director. 1907 Produced a light goods chassis. 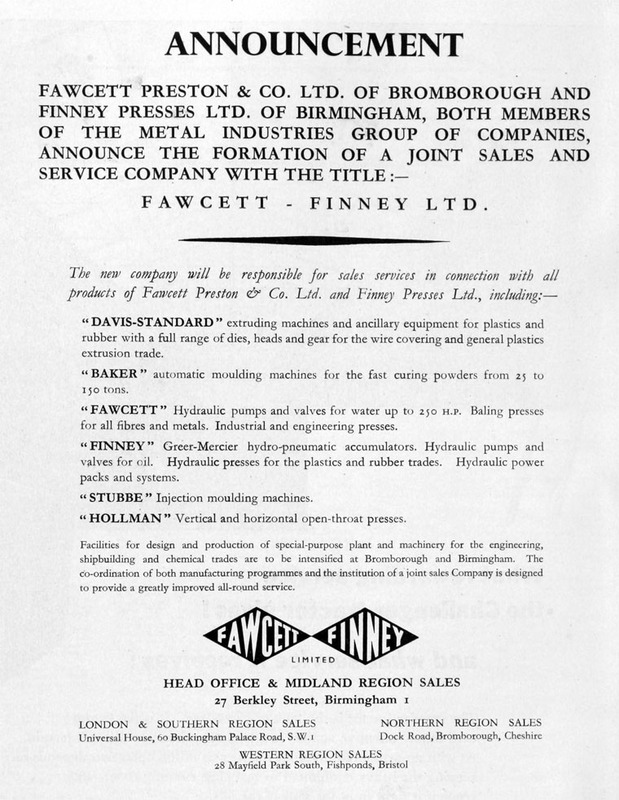 1958 Merged with another Metal Industries subsidiary, Finney Presses; operations concentrated at Bromborough; the Fawcett facility at Birmingham was closed. 1967 Metal Industries sold Fawcett, Preston and Co, rubber and plastic extrusion machinery makers to Tube Investments. Location of Phoenix Foundry: The foundry fronted onto Lydia Ann Street. Map here. 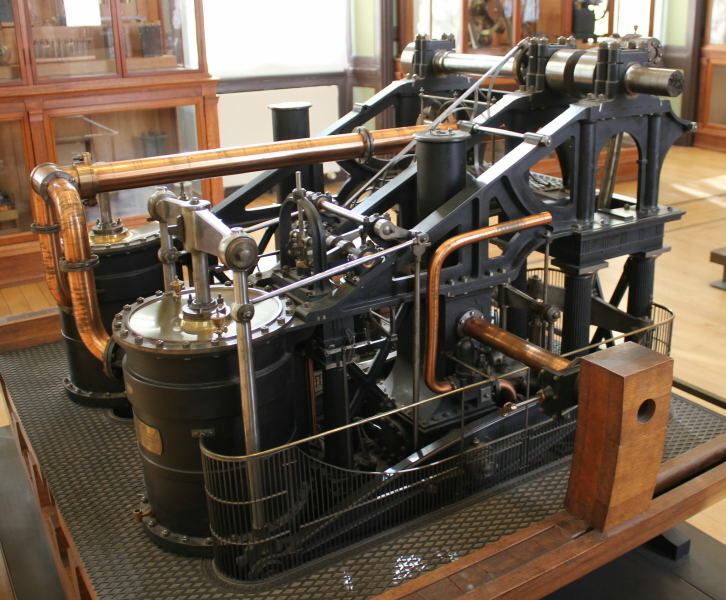 1829 Made the side lever engine for the French Navy's first steam ship, the Sphinx. A large scale model of the engine, made in 1843, is on display at the Musée des Arts et Métiers. See PS Sphinx: Side Lever Engine. 1830 Steam packet 'Paul Pry' advertised for sale, with 14 HP engine by Fawcett, Preston. 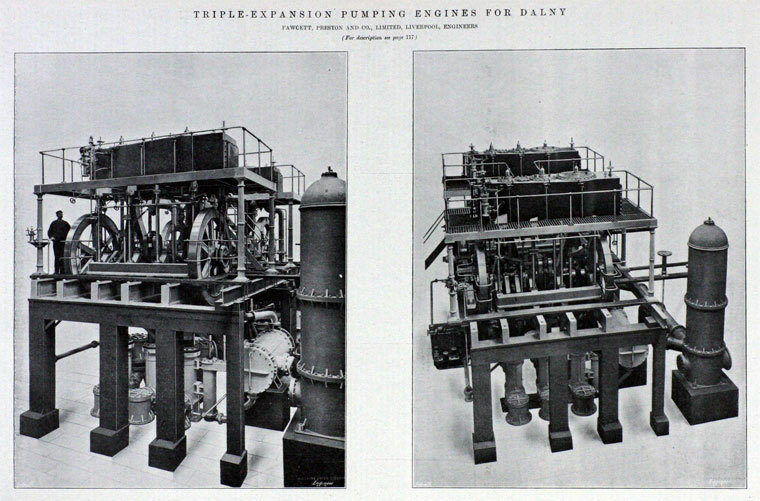 1838-42 See 1839-1842 Marine Engine Makers for details of engines made for the Admiralty. 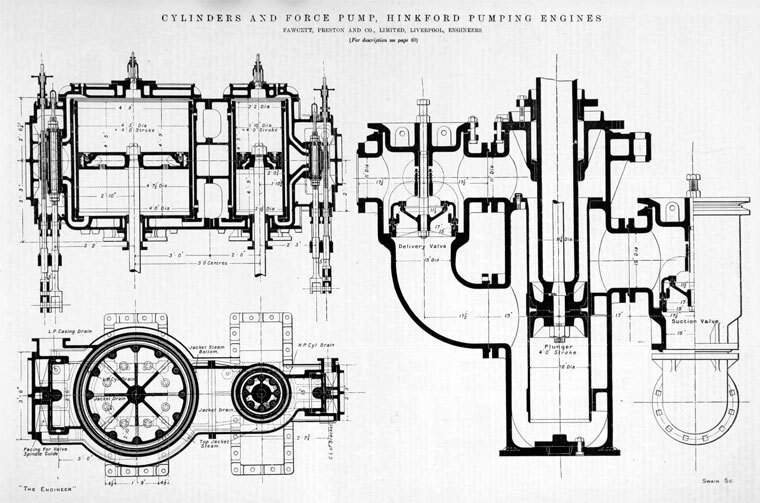 c.1839 320 HP engines for the Dublin-Liverpool mail packets Medusa and Merlin (designed by Sir William Symonds). 1840 Made side lever engines for the French frigate 'Gomer' ('La machine ... a été construite en 1840, par Fawcett et Preston, pour la frégate le Gomer'). 1840 The firm made the machinery of the President, the largest Atlantic steamer built up to that time. 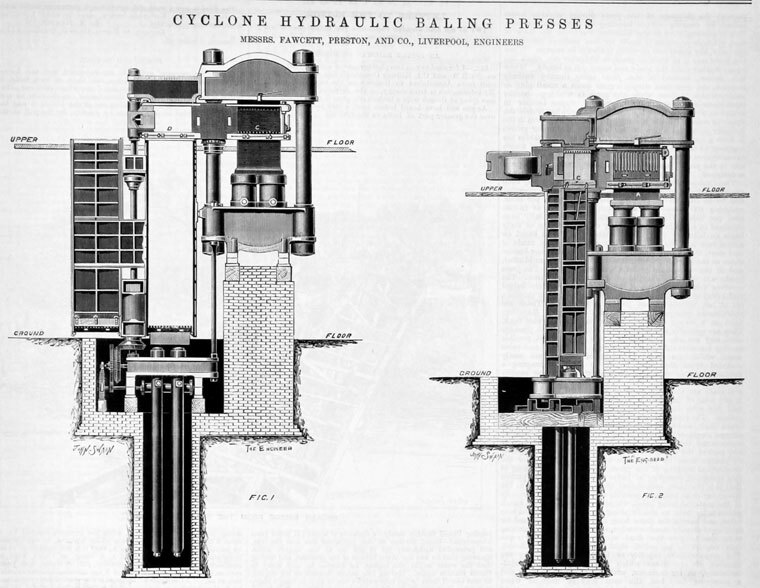 'The President's Engines.— Our readers are already aware that the fine steam-vessel, the President, now lying in the Trafalgar Dock, has been brought from London to this port to be fitted and take on board her engines, manufactured our townsmen, Messrs. Fawcett, Preston, and Co., who have obtained considerable celebrity in the annals of steam-engine making on account of the high character which their engines bear in the mercantile world. The engines in question, which have in the usual preliminary way been fitted in the yard of these gentlemen, in York-street, in order to their completion, are now in course of being taken down, preparatory to their removal on board the President. They are the largest marine engines hitherto made in this or any other country, being of 540 horse power, and are said by competent judges to be unrivalled for strength and neatness. They are certainly of colossal magnitude, and cannot fail to elicit the admiration of the spectator, scientific or otherwise. Their style is that of the gothic, and no pains have been spared to render them worthy of the establishment in which they have been manufactured. The respected proprietors of the works kindly permitted a considerable portion of the public to inspect them, and for the last two or three weeks the parties who have visited the Phoenix Foundry have been very numerous. To give our readers some idea of ihe magnitude of these splendid specimens of human skill and ingenuity, we subjoin a few particulars of the engines. Height of columns 23 feet 0 inches. 1847 Made 200 HP side lever engines for the Guadalquiver, built by Thomas Vernon and Co for a Cuban company. 1845 'Trial of the Monster Gun.— On Friday, and again on Saturday, the monster gun, recently manufactured by Messrs. Fawcett, Preston, and Co.'s foundery, Liverpool, for the American war steamer Princeton, was repeatedly tested on the sands, about three miles beyond Waterloo. The gun was conveyed from the foundery to the place selected for the trial about four o'clock on Friday morning, when very few of the inhabitants were astir in the streets. About half-past five it passed through Bootle, almost unobserved, most of the good people of that locality being in the enjoyment of their morning dreams at the time. It was drawn by nine horses. On arriving at its temporary destination, it was firmly embedded in the sand, and the muzzle, which was pointed out to sea, was slightly elevated in a line above the surface of the water. The first ball, weighing 219lbs., was then driven home, the gun being charged with 30lbs. of powder, and the first shot was fired at ten, in the presence spectators. The result was most satisfactory. The report was deafening, and was distinctly heard nine miles off. At the distance of about three miles, as nearly as could be judged, the ball was seen bounding the surface of the water, occasionally dipping and springing again, until at length it became wholly lost to view. The second was the trial shot. Two balls, each weighing 219lbs., were " driven home," 45lbs. of powder being the charge. This shot was equally satisfactory. The report, of course, was terrific, but the gun withstood the shock, and thereby proved that it had been manufactured on a principle and with a material which render bursting almost, if not altogether, an impossibility. A great number of single shots, with balls of 219lbs. each, were fired during the afternoon of Friday and the whole of Saturday, with the like successful result. We understand the gun will be shortly shipped by vessel for America, there to be taken on board the war steamer for which it was manufactured.'. 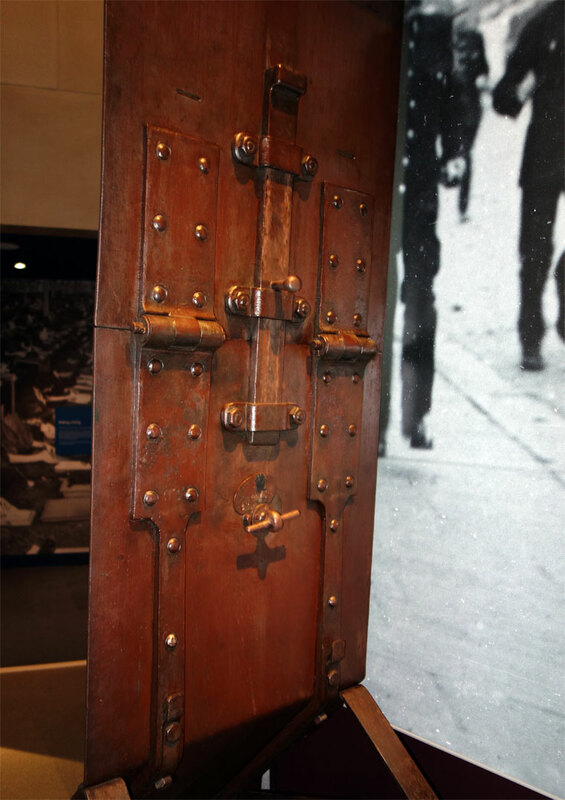 Note: the forgings for the gun were produced by the Mersey Steel and Iron Co.
'The Monster Gun for the Princeton. —The enormous gun made in this town to supply the place of Captain Stockton's gun, which burst on board the Princeton, American war steamer, with such dreadful results, is now ready for use, and was tried on the shore near Formby, on Friday, Saturday, and Monday. Not less than 24 shots have been fired from it, all of them with a larger charge of powder than that which will be used under ordinary circumstances, and in one case with charge of double the ordinary strength. It stood the trials well, and may safely be considered one of the strongest as well one of the largest pieces of cannon ever made. We sincerely trust that it will never be turned to worse use than it was on Friday, Saturday, and Monday. The following are some interesting particulars with regard to the gun and its trials :— " Proved 40th[!] May, 1845, at Formby, near Liverpool. Twenty-three shots were fired out of it, and the proving of it occupied the whole of Friday, 30th, Saturday, 31st May, and Monday, 2d June. To prevent as much as possible the crowd from hindering the operations, the day fixed for proving it was kept a secret, and early in the day there were not more than 200 people present, but it was very soon known what was going on, and people began to arrive pretty thickly about two and three o'clock. 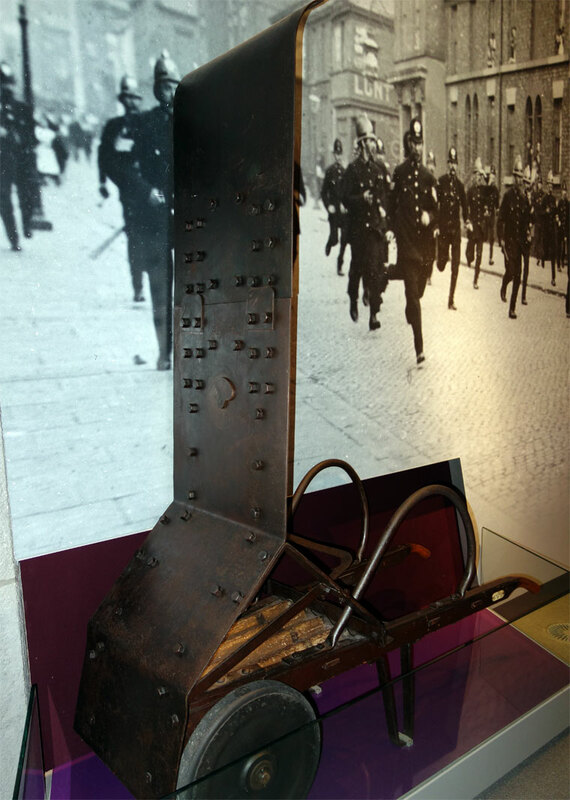 The gun was removed from Fawcett, Preston and Co.'s yard at two a.m. Friday, and, just outside the town, the bushes of the under wheels came out, and the men were detained till two more timber carriage wheels could be obtained. The first shot was fired about ten o'clock. 2d— 40lbs. " double shot, 220lbs. each. 3d- 44lbs. " " 220lbs. Note: For more information on molten iron-filled shells, see HMS Colossus. Produced many guns to the design of Alexander Blakely. 1876 Photos of details of an 1876 2.5" Blakely rifled field gun here. 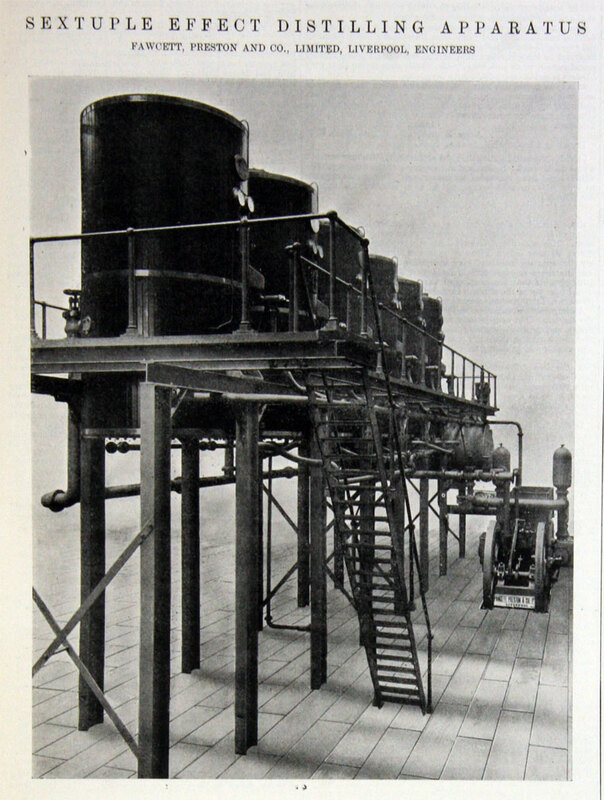 Fawcett, Preston were pioneers and major producers of equipment for processing sugar cane. c.1830 Supplied sugar cane processing machinery, including a waggon boiler, beam engine, and crushing rolls to a plantation in the Approuague region of French Guiana. 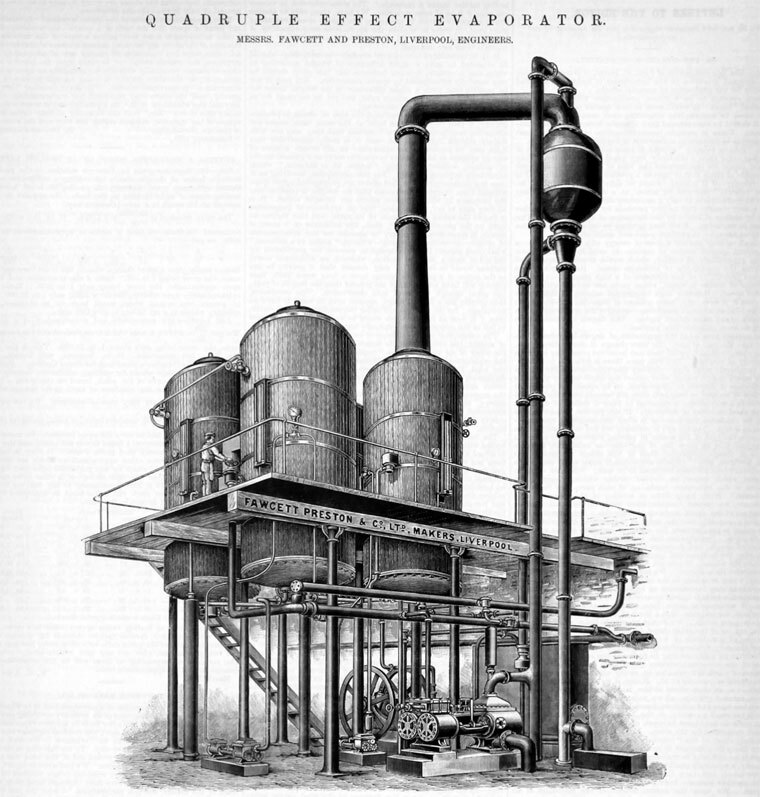 1834 Supplied a 36 HP stationary engine to the New Orleans Sugar Refining Co.